Continuing on the theme of the human condition, this body of work explores the concepts of both euphoria and impending doom at the same time while struggling to figure out which one is actually the positive experience. This show will consist of new drawings, paintings and site specific installation. Both artists share roots in skateboard culture out which they have derived distinctive styles in conceptual art. Cody Hudson's constructions are known for their abstract and colorful playfulness. For this show the project room will feature a large sculpture by Cody Hudson made of found objects and collected tambourines, which also consists of a sound component created by Caural (Zachary Mastoon), titled "Tambourines for Cody." Cody Hudson is a Chicago based painter, also known for his commercial art and graphic design contributions under the name Struggle Inc. His graphic work and paintings have been exhibited throughout the US, Europe and Japan including the Museum of Contemporary Art (Chicago), Rocket Gallery (Tokyo), The Reed Space (NYC), The Lazy Dog (Paris), & Bucket Rider Gallery (Chicago). Cody's work has been featured in numerous magazines and publications including idN, Arkitip, Anthem & Juxtapoz. His work can also be seen on random corners of Chicago streets, where he frequently participates in the construction of found object installations. Sean Cassidy currently lives and works in Los Angeles. His work has been described as a marriage of scientific and chaotic thought producing an aesthetic and symbolic idiolect. 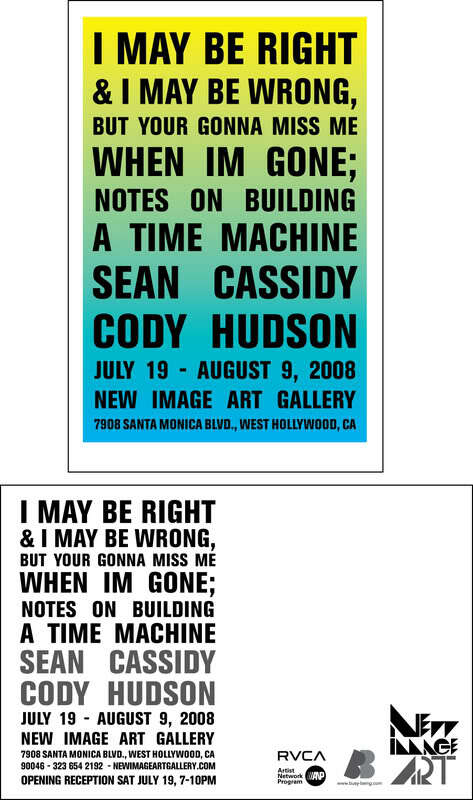 His first solo show in April of 2007 was titled "Memory is a Vacuum," exhibited at New Image Art.